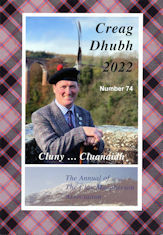 Creag Dhubh is published in spring each year and is sent to all members of the Clan Macpherson Association throughout the world. news of the Associations Branches located throughout the world, and the financial report of the Association and the Clan House operation. The Editor is also delighted to receive all kinds of news from individual members. As an association we have a tremendous opportunity for positive networking given extra impetus by the genetic connections that we have with each other and our strong roots (however far back) in the Highlands of Scotland. What makes Creag Dhubh interesting is not just the historic and academic content, but the news about 'us', the clansfolk across the globe. So do send the Editor personal news about births, engagements, marriages, deaths, career moves and any other general news about what Macphersons and their relatives are doing, achieving or even enduring. When sending in articles, electronic versions make life easier, but please provide any pictures as separate files, rather than embedded in the documents. The editor can use documents in ASCII text files, Word, RTF or PDF. Advertising is an important way of keeping costs down as well as adding interest. The adverts in Creag Dhubh are often as interesting as the articles as we discover sources of kilts, books, whisky and other goods and services. The circulation of the magazine is worldwide to groups of people with useful spending power, so please could you recommend Creag Dhubh to possible advertisers? Anyone wishing to advertise should contact . An index of article titles from the first issue in 1949 to 2019 is available for download from here. The Creag Dhubh Library DVD is now available for purchase from the Museum. The DVD contains issues of Creag Dhubh starting in 1949 up to 2018, charting the history of the CMA in an easily searchable Adobe Acrobat PDF reference source. We would like to track the effectiveness of the distribution system we used for Creag Dhubh, and we would like your help. Please enter your town, country and date you received Creag Dhubh in the fields below and click "Continue". Note we do not need your name. Thank you for your help.